Turkish armored vehicles at the border with Syria on October 15. 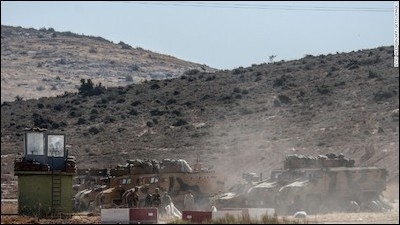 The Turkish military this week scouted Syria's Idlib province, in the north west of the country, in preparation for a military operation in the province. The deployment of a reconnaissance team into Idlib came days after Turkish troops and armor massed on the Turkish Syrian border, and a section of the border wall was dismantled to allow the passage of military vehicles. Turkish President Recep Tayep Erdogan told a rally of supporters of his AKP party in the town of Afyonkarahisar on Saturday that a "serious operation" was underway in Idlib. The operation, he added, would be carried out by fighters of the "Free Syrian Army." Rebels from a variety of Turkish backed factions, in turn, are assembling at the border in the Reyhanli area. What is the background to this latest move? Why does Turkey appear to be preparing another major incursion into Syria? Idlib province is currently controlled by the Hayat Tahrir al-Sham group. This is the latest iteration of the organization once called Jabhat al-Nusra. Nusra was the franchise of the al-Qaeda network in Syria. HTS claims to have cut links to al-Qaeda, though few analysts regard this move as more than tactical. While there is strong evidence of cooperation between Turkey and HTS in the past, the issue of HTS dominance has now become a matter of concern for Ankara. "Idlib province is the largest al-Qaeda safe haven since 9/11," according to Brett McGurk, the U.S. special envoy to the global anti-ISIS coalition. 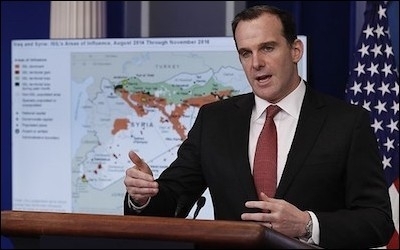 US official Brett McGurk described Idlib in July as "an al-Qaeda safe haven right on the border of Turkey." It is clear that there is pressure from both the US and Europe for the termination of the de facto al-Qaeda safe zone that has emerged in Idlib Province. From this point of view, the West may well welcome a Turkish move to reduce the power and autonomy of HTS in Idlib. However, Turkey's move toward intervention in the province relates most centrally to Ankara's broader agenda and concerns in Syria – most specifically with regard to the Kurdish forces in the country, with which the West is currently aligned. The impending Turkish move into Idlib takes place in the context of the Astana agreement between Russia, Turkey and Iran, which envisaged the creation of four 'de-escalation zones' in western Syria. These were to be in Idleb, in the Rastan-Talbiseh area, in Eastern Ghouta close to Damascus, and in Quneitra, Dera'a and Suweydah provinces in the south, adjoining the Golan Heights. Turkish media reports suggest that Turkey will take control of an area of northern Idlib province, close to the Turkish border, in a move analogous to the 'Euphrates Shield' operation in August 2016. On that occasion, Turkish forces captured the area between Jarabulus and Azaz on the border. The central Turkish ambition is restricting the advance of Syrian Kurdish forces. In both cases, the central Turkish ambition related not to the general Syrian situation, but rather to Ankara's specific agenda of restricting the advance of the Syrian Kurdish forces of the YPG/Syrian Democratic Forces. Euphrates Shield inserted Turkish armed force between the Kurdish controlled cantons of Jazeera/Kobani and Afrin. In so doing,it effectively ended Kurdish hopes of uniting the cantons and attaining Kurdish control of the entire 900 kilometer long border between Syria and Turkey. The Kurdish authority in Syria is aligned with the PKK, (Kurdish Workers Party), which has been engaged in an insurgency for greater Kurdish rights in Turkey since 1984. From a Turkish point of view, therefore, preventing Kurdish control of the entire border was essential. The expected move into Idlib looks set effectively to be the second phase in this effort, in which Turkey will seek to isolate the Kurdish Afrin enclave from its south by occupying northern Idlib. Afrin would then be entirely boxed in, with the Turks to its north, east and west, and the regime to its south east. Turkey seeks to isolate and box in the Kurdish Afrin enclave. This would prevent any possibility of the SDF moving against al-Qaeda associated forces in Idlib and thus expanding the Kurdish enclave. It might also presage a later Turkish move against the Afrin enclave, though at present this is unlikely because of the US alliance with the Kurds, and also because of the presence of a small Russian military presence insideAfrin. The centrality of the anti-Kurdish agenda in Turkey's planning illustrates the extent to which the Turks have now conclusively abandoned any notion of 'regime change' in Syria. Assad is clearly here to stay, in Ankara's view. Any move into Idlib would be conducted in full cooperation with the regime's Russian patrons, and probably with Russian air support. For this reason, while a Turkish move into Idlib would be an ostensibly pro-rebel move, many exiled Syrian supporters of the rebellion in Turkey are unenthusiastic about it. They see the move, correctly, as solidifying Turkish cooperation with Russia, which the rebels regard as the main enemy of their cause. Russia, after all, is the factor which turned the tide of the Syrian war. Its entry in September 2015 was in response to a period of rebel advances. The Russian intervention reversed the rebel advance and enabled the ascendance of the regime side. Turkish cooperation with Russia in Idlib offers further grim confirmation for the rebels of the failure of their cause. For many rebel supporters, also, HTS are considered comrades in arms, albeit extremist ones. The notion of Turkey acting against them, even partially and symbolically, with Russian cooperation, is a hard morsel to swallow. Turkish cooperation with Russia in Idlib offers grim confirmation of the failure of the rebel cause. Nevertheless, the Turkish move indicates that Erdogan still sees himself as the patron and ally of the rebels, and evidently does not intend simply to abandon them to the mercies of the Assad regime. The Turkish move could not of course take place without Russian permission, since Russia controls the skies of northern Syria. This indicates that for now at least, Russia is content to see Syria continue to be divided into zones of influence, with the concerns of bodies other than the Assad regime being taken into account. From an Israeli point of view, given Israel's concerns to prevent Iranian and Hizballah encroachment in south west Syria toward the Golan Heights, this may be an encouraging sign. However, it should be borne in mind that for the moment, the focus of Russia, Iran and the regime is in eastern Syria, where the fight against Islamic State is still under way. Russia wants to grab as much of the oil and gas assets of Deir a Zor province as it can, before the US-supported SDF do. Iran, meanwhile, is engaged in seeking to secure its contiguous corridor between the Iraqi border and the Mediterranean. Once the war against IS is complete, the issue of arrangements further west will come back onto the agenda. At this point, the current zones of influence may once again become a subject for discussion. For now, Turkey is mainly concerned with the urgent matter of seeking to box in and strike at the Kurds. It is in this context that the apparently impending move on Idlib province needs to be understood. Final arrangements in northern Syria remain to be decided.